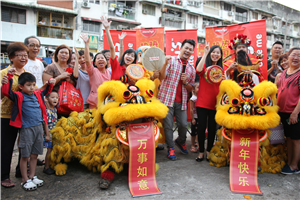 KUALA LUMPUR, 24 January 2015 –MUZIC, the delicious and crunchy wafer brand, along with actor Jack Lim from the hit movie ‘Ah Beng’, gave the residents of Cheras something to shout about when they made a surprise visit at Yulek wet market to introduce their new Chinese New Year pack, featuring the essence of ‘Yit Lau’ (Happy Loudness). The engagement takes place in conjunction with MUZIC ushering in the Year of the Goat and commemorates the principles of ‘Yit Lau’ –a Chinese belief that the noisier and merrier the atmosphere, the more auspicious the occasion! This has also inspired the design of the MUZIC festive pack, decorated with auspicious drawings and characters to enact‘Auspiciousness’, ‘Prosperity’, ‘Happiness’ and ‘Good Fortune’. 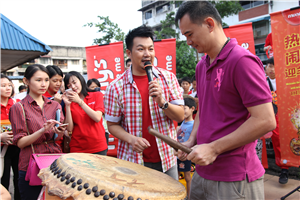 With lion dance performers, games and prizes, topped off with Jack Lim’s signature comedic antics, MUZIC rolled back the years and brought the spirit of ‘Happy Loudness’ (YitLau) to the market which hosts hundreds of traders and customers daily. Jack’s presence clearly brought back smiles and an air of celebration as both young and old enjoyed the rare opportunity to mingle with the multi-talented deejay, host and actor. Despite the early hours, the residents eagerly participated in the fun-filled festive games to win MUZIC goodies from Jack. “For this Year of the Goat, we wanted to bring back some of the ‘Happy Loudness’ to this wet market and give the community a treat to remember. 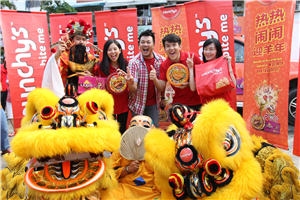 Hence, by offering the MUZIC Chinese New Year pack which embody the true meaning of ‘Yit Lau’, we are actually sharing the beautiful Gift of Auspicious Sound, all rolled up in one delicious drum,” said Julie Chen, General Manager of Marketing, Munchworld Marketing. By sharing MUZIC with family and friends, not only the taste is shared, but also the spirits which serenade the wholesome spirit of Chinese New Year. The MUZIC Chinese New Year Pack comprises delicious MuzicLuxury Wafer Rolls and comes in two delectable variants: ‘Fatt Choy Chocolate’ which comes in a lovely tin with eye-catching maroon coloured rims that represents ‘Good Fortune’ and ‘Ang Ang Orange’ with auspicious gold coloured rims that represents ‘Good Luck’ or Gold. The auspicious illustrations surrounding the tin such as a Drum, the Lion Dance and a United Family sign ify auspiciousness, merriment and the joy of reunion with friends and family. Each pack also comes with one of four symbolic paper inlays with the Chinese characters: ‘Auspicious’, ‘Prosperity’, ‘Happiness’ and ‘Good Fortune’. Each 500 gram pack is priced at RM12.90 and currently available on shelves at all grocery stores, hypermarkets and supermarkets nationwide.